At Paris, just after dark one gusty evening in the autumn of 18—, I was enjoying the twofold luxury of meditation and a meerschaum, in company with my friend C. Auguste Dupin, in his little back library, or book closet, au troisième, No. 33, Rue Dunot, Faubourg St. Germain. For one hour at least we had maintained a profound silence; while each, to any casual observer, might have seemed intently and exclusively occupied with the curling eddies of smoke that oppressed the atmosphere of the chamber. 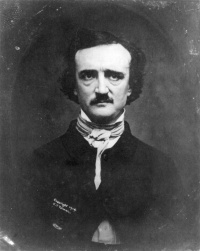 For myself, however, I was mentally discussing certain topics which had formed matter for conversation between us at an earlier period of the evening; I mean the affair of the Rue Morgue, and the mystery attending the murder of Marie Rogêt. I looked upon it, therefore, as something of a coincidence, when the door of our apartment was thrown open and admitted our old acquaintance, Monsieur G— —, the Prefect of the Parisian police. "Ha! ha! ha — ha! ha! ha! — ho! ho! ho!" roared our visitor, profoundly amused, "oh, Dupin, you will be the death of me yet!" "The measures, then," he continued, "were good in their kind, and well executed; their defect lay in their being inapplicable to the case, and to the man. A certain set of highly ingenious resources are, with the Prefect, a sort of Procrustean bed, to which he forcibly adapts his designs. But he perpetually errs by being too deep or too shallow, for the matter in hand; and many a schoolboy is a better reasoner than he. I knew one about eight years of age, whose success at guessing in the game of 'even and odd' attracted universal admiration. This game is simple, and is played with marbles. One player holds in his hand a number of these toys, and demands of another whether that number is even or odd. If the guess is right, the guesser wins one; if wrong, he loses one. The boy to whom I allude won all the marbles of the school. Of course he had some principle of guessing; and this lay in mere observation and admeasurement of the astuteness of his opponents. For example, an arrant simpleton is his opponent, and, holding up his closed hand, asks, 'are they even or odd?' Our schoolboy replies, 'odd,' and loses; but upon the second trial he wins, for he then says to himself, 'the simpleton had them even upon the first trial, and his amount of cunning is just sufficient to make him have them odd upon the second; I will therefore guess odd;' - he guesses odd, and wins. Now, with a simpleton a degree above the first, he would have reasoned thus: 'This fellow finds that in the first instance I guessed odd, and, in the second, he will propose to himself, upon the first impulse, a simple variation from even to odd, as did the first simpleton; but then a second thought will suggest that this is too simple a variation, and finally he will decide upon putting it even as before. I will therefore guess even;' - he guesses even, and wins. Now this mode of reasoning in the schoolboy, whom his fellows termed 'lucky,' - what, in its last analysis, is it?"